When asked to be interviewed about his career at J. Sargeant Reynolds Community College, electrical engineer and teacher George Flowers said that he hadn’t done anything particularly special and wasn’t sure an interview was necessary. Mr. Flowers retired from the College in December 2012. After a full career as an engineering manager at Virginia Power, Mr. Flowers began his second career as an educator at the College in 1994 as a Division Chair, and later as the Parham Road Campus Director. Along the way, he also taught students in math and engineering. For ten years he taught two classes a semester, three semesters a year, with about twenty students per class. That’s a lot of students, a lot of lives touched, and a lot of meaningful work. Most would agree that’s something special. After graduating from Duke University, he took a job in the Newport News shipyards as an electrical engineer working on nuclear submarines. Later he earned his Master’s Degree in Electrical Engineering at the University of Virginia. During this time he made a life plan of working in industry, then serving in some public capacity, and then taking all the lessons learned back into the classroom. Before he could complete a doctoral degree, he was asked to help with his father’s waste management business. Then, it was on to Virginia Power, building and operating nuclear power stations, and earning a Masters in Business Administration degree from Virginia Commonwealth University. When he retired from the power company, he revisited the life plan he had made at age 26 and decided to continue following it: to use what he had learned in the private sector to help others through education. “It was my obligation,” he stressed. 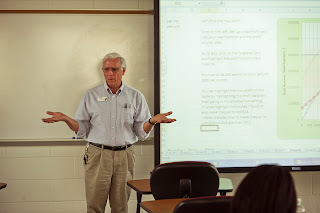 During his first few weeks at the College, the community asked the Engineering and Applied Sciences Division, Mr. Flowers and his team, for an education plan to help attract a new industry to the greater Richmond area – semiconductor manufacturers. He helped to set up and lead a consortium of VCCS colleges for semiconductor technician training in the mid-1990s. Later, he helped the College and Infineon sponsor a two year Electronics Associates Degree at Infineon’s location. As a study aid, he created dozens of calculator and spreadsheet models for his math and engineering students. Former students still call him to let him know that they use his models in their day-to-day problem solving efforts. In 2011, after the College had been awarded two federal grants to its Automotive Technology Group, Mr. Flowers stepped in as an electronics engineering advisor to guide the team as it developed new course curriculum for diagnostics and repair for hybrid and electric vehicle components. When talking about the future, Mr. Flowers has plans to travel and volunteer. “The College is part of my life and always will be,” he said. “The College family is really special.” He and his wife Alice have endowed two full student scholarships at the College. “We had a lot of help with our own education, and we wanted to give a little back.” Helping others up until his last day at the College, he advised a young transfer student on her options and opportunities. He was still working his plan and doing something which may not have seemed “particularly special” to him, but the student will remember and perhaps create her own life plan which involves helping others. 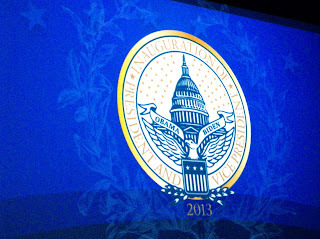 Three JSRCC students in the college’s Great Expectations program were among a group of 30 students and coaches who attended President Barack Obama’s Inauguration on Monday, January 21st. The tickets were given to the Virginia Community College System who in turn shared them with students in the Great Expectations program from around the state. Dedra E. Hampton, Great Expectations Coordinator/Coach for JSRCC, selected the three JSR students based on their academic achievement. The Great Expectations program helps young adults who are or were recently affiliated with the Virginia Foster Care System transition to college. The program helps Virginia’s foster youth gain access to a community college education and transition successfully from the foster care system to living independently. There are currently 62 students at J. Sarge enrolled in the Great Expectations program, the largest Great Expectations program in the state. Since 2008 when the program was created at JSR, more than 400 students have participated in the program at the College. The students were responsible for their own transportation to Washington, and the group assembled to watch the Inauguration which started at 11:30 a.m. In addition to attending the inauguration, the group attended an Open House hosted by the Casey Family Programs, an organization whose mission is working to ensure that every child has a safe, nurturing, and permanent family. At the Open House the group met other foster care youth and alumni representing four different states, and they had a chance to network with representatives of The Rising Tides, an organization that provides numerous financial benefits to foster youth, and The Foster Club of America. For more information on the Great Expectations program please visit http://www.reynolds.edu/ge/default.htm or contact Dedra Hampton at dhampton@reynolds.edu. Pamela Thomas expressed to Delegate Joe Morrissey that it is very important to keep the cost of attending J. Sargeant Reynolds as affordable as possible. Thomas is currently pursuing a degree in nursing at Reynolds while also working full-time and providing financial assistance to her daughter who is a student at James Madison University. Linda Anderson shared with Delegate Lee Ware that she was a hairdresser for over 30 years, but when the recession hit, she knew she had to find a more stable career. Following the morning visits, the students toured the Virginia State Capitol, the building that holds the nation’s oldest legislative body. During the General Assembly session, the group was introduced and welcomed by Delegate Ware. The New Year has started off well for Stephanie Louise Boehles, a culinary arts student at J. Sargeant Reynolds Community College as she has been selected as a finalist for a 2013 Elby Award in the Culinary Student of the Year category. The second annual Elby Awards, sponsored by Richmond Magazine, and named for renowned French chef and Richmonder Paul Elbling, will be awarded on Sunday evening, February 10, 2013, at the Virginia Museum of Fine Arts. Stephanie’s instructors at JSRCC nominated her for this distinction. Growing up Stephanie gained an appreciation of food and cooking from her Italian mother and Irish father. She also worked at Mosaic Café for several years while attending school, mostly in their catering operation. About a year ago she transitioned from Mosaic’s catering operation to its restaurant. While she has experience in many phases of the restaurant’s operation, she now mostly works in the kitchen as a line cook. Stephanie is also the President of the Culinary Arts Career Educational and Experiential Club (CACEE), at JSRCC. Stephanie expects to complete her Associate Degree in Culinary Arts in August 2013. Her goal after graduation is to gain more restaurant experience and to return to VCU to complete her political science degree. Her long term goal is to own and operate a small bed and breakfast inn. Whether or not she is selected as the Culinary Student of the Year by the award judges, Stephanie’s future looks bright. She has already earned 110 credits at Reynolds with a grade point average of 3.709 on a 4.0 scale. In her spare time, Stephanie’s other interests include Scottish Highland dancing, serving as a 4H Archery and Rife Instructor, and as a member of the River City Rollergirls. The Virginia General Assembly honored J. Sargeant Reynolds Community College’s 40th Anniversary with a House Joint Resolution offered January 15 by Betsy B. Carr, a member of the Virginia House of Delegates representing the 69th district, which includes part of Richmond and Chesterfield County. The resolution notes that the College has served more than 308,000 students in credit coursework since opening in 1972. You can follow the progress of the resolution at HJ 733 Commending J. Sargeant Reynolds Community College. RESOLVED FURTHER, That the Clerk of the House of Delegates prepare a copy of this resolution for presentation to Gary L. Rhodes, president of J. Sargeant Reynolds Community College, as an expression of the General Assembly’s congratulations on this historical milestone. We started out early to go to the general assembly and talk up J Sergeant Reynolds and all the good things it has done for us. Even though it was rainy and cold we made our to the state library and listen to the president of the VCCS speak about what we are here to do at the general assembly. I was asked, along with a couple of my fellow classmates to visit some delegates. We first visited Delegate Loupassi, then Delegate Betsy Carr. We had a great laugh with Delegate Riley Ingram who had many stories to tell about his 30 odd years as a house of delegates member. Unfortunately Senator McDougle was not able to meet with us in person but we did get our message across to his aide. We went to the Capitol building where we were recognized by Delegate Carr and able to stand for recognition..that was really cool!!! After that it was time for lunch thanks for the Padows Deli luncheon J Sargeant Reynolds...it was a very excited day!! One look at the calendar lets us know that winter weather is just around the corner. No one wants to be stranded on the side of the road on a dark, stormy night with a broken down vehicle. With the assistance of Kelly Schwendeman of JSRCC’s Automotive Technology program, we have identified several simple steps you can take now that will greatly reduce the chance of such an occurrence. “Your car’s battery is under stress and strain in cold winter conditions,” according to Schwendeman. “Have your battery tested by a technician using professional equipment to ensure it has sufficient power. The Richmond area doesn’t normally get a lot of snow, but if it does snow you will need good tires with sufficient remaining tread to get through it.” Schwendeman also recommends replacing tires if they are worn and checking tire pressure and adjusting it to the specification in the owner’s manual. Windshield wipers are a driver’s best friend in bad weather. ”Replace your wipers if they are starting to leave streaks on your windshield, and don’t forget to fill the windshield wiper fluid reservoir,” Schwendeman added. “Don’t use water because it will freeze.” In addition to a clear windshield, all of your lights need to be in working order. It is often difficult to see in winter weather and a clear windshield and working lights will help to keep you safe. Speaking of freezing, make sure to have your anti-freeze coolant level and condition checked to ensure that it will not freeze. If the anti-freeze is old or diluted, have it replaced to protect your engine from freezing. Also make sure that your heater/ventilation/air conditioning system is working properly. Many people don’t think they need air conditioning in the winter time, but your AC system works with the defroster and heating system to dehumidify the air and keep your windows clear. You should keep your fuel tank at least half-full to reduce moisture, and check to see if it is time to have the fuel filter changed. The fuel filter may contain water that will freeze and keep your engine from running. It needs to be replaced according to the maintenance schedule in your owner’s manual. Even with all these precautions it’s a good idea to keep some emergency items in your car, just in case you get stranded. Items to consider include a blanket, small shovel, flares, gloves, boots, flashlight, and a cell phone. Lastly, drivers must remember that winter driving conditions limit your vehicle’s traction and control. When the road is slick SLOW DOWN. This includes four wheel drive vehicles. Your four wheel drive system will help you get moving, but once you are moving your traction and control are still limited by the conditions. These simple precautions will help you to enjoy the winter wonderland! Welcome to the Spring 2013 Semester! We are excited to have you back on campus! Whether you are a new or returning student, we are pleased that you chose J. Sargeant Reynolds Community College to meet your educational goals. We hope that you found time to relax, refresh and rewind during the holidays and that you are happy to be back, seeing old friends and looking forward to making new ones this winter. If you haven’t registered for classes, it’s not too late! Late registration for the first session of classes runs through Friday, January 11th and additional class sessions begin on February 5th, March 5th, and April 9th. You’ll want to know about the many events that Reynolds has going on throughout the semester, so check out Student Life’s Events Calendar at http://www.reynolds.edu/studentlife. Upcoming events include Name That Tune Music Trivia games in January, a bus trip to an NBA game in February, Spirit Week, 3 on 3 Intramural Basketball and Intramural Soccer just to name a few. On a more serious note, renovations at the Downtown campus continue and some services have been temporarily relocated while construction takes place. For the most up-to-date information on Downtown Campus renovations, visit www.reynolds.edu. Did you know that every year the college awards scholarships to Reynolds students totaling between $300,000 and $400,000 and that individual scholarship awards range from $100 to $3,500? Find out more by visiting http://www.reynolds.edu/jsr_fnd/supportfdn/areas/scholarships.htm. Beginning this semester scholarship applications must be submitted online between January 1st and April 15th. Please note that scholarship applications will not be accepted before or after these dates. We urge you to take advantage of the many resources available to you at JSRCC. The faculty and staff stand ready to help you achieve your educational goals. We wish you great success this semester.